A cry erupts from our hearts – our cri de coeur – notice how things always sound more eloquent in French. A cry erupts: how can I/we make a difference? Because we often don’t see how we really do make a difference through the ordinary everyday events of living our lives, our cri de coeur becomes – how can we experience ourselves making a difference? For me, this is a deeply personal question. However, I feel this not just as my question. I feel it personally in relation to my community. So now the question moves towards a partial answer as it broadens into – can I experience myself making a difference through being part of a community that makes a difference? Having broadened the focus of the cry of my heart to encompass my role in community action, I now narrow it down again to myself. Now, my cri de couer becomes – where does my responsibility lie to ensure that my community is making a difference in the world? Part of the answer lies in my participating, playing my part, in the community. We often hear ourselves saying – it’s not my responsibility. I’m rather fond of the oft used American expression – that’s above my pay grade. The limitation of responsibility becomes a core preoccupation in our collective life, i.e. our lives lived in relationships, families, institutions, and in communities. As a society we are increasingly into the blame game. This makes taking responsibility is a fearful thing to do. Being responsible equates with being vulnerable to carrying the blame when something goes wrong. Consequently, we live in a tension. We long to experience ourselves making a difference. 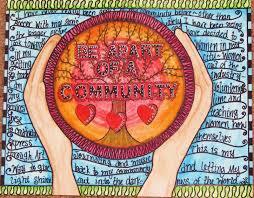 The way into that for most of us is through our involvement in communities that make a difference. Yet, at the same time we fear involvement because it carries responsibility. Responsibility carries the risk of being blamed when things don’t go right. More crucially though, we fear taking-on responsibility, because of our experience of being drained and exhausted, finding ourselves burdened by being given more responsibility than any one person is able to realistically shoulder. So we hold back. We protect ourselves. And in so doing we experience the encroaching corrosion of a sense of futility. The experience of futility is the fruit of our feeling that there seems nothing we can do to make a difference; that there is nothing we can do to change the world for the better. Futility corrodes our self-confidence and results in our imprisonment within a cocoon of fearfulness. As a human being, the cry of my heart is an expression of my longing to move beyond my fears, into an experience of myself making a difference. Between last week and today the Lectionary leapfrogs to Matthew’s account of Jesus’ arrival in Jerusalem. It’s odd to find ourselves here I think, because these are the events we more properly celebrate on Palm Sunday and during Holy Week. Earlier in chapter 21 Matthew records Jesus’ arrival in the Temple precincts, where he creates a ruckus of monumental proportions. A new side of Jesus’ personality comes into view as he gives vent to rage, an emotion we have hitherto not encountered in Matthew’s depiction of Jesus. Consequently, Jesus has really jangled the nerves of the Temple authorities, the priests and scribes. For they are not simply the religious rulers, but like the Dalai Lama, they are also the de facto civil government of the Jews and as such are directly responsible to the Roman overlords. So they are concerned about keeping a lid on subversive elements taking advantage to create civil unrest at the most volatile time of the Jewish Year, the celebration of Passover. Therefore, to put it mildly, Jesus seems to be acting in a particularly provocative manner, almost designed to bring the wrath of authority down on his head. There is a complex argument taking place between Jesus and the authorities concerning the difference between authority and power. They have the power, and yet they are anxious about his authority. Their very denial of his authority is confirmation they think he has some. Jesus begins a cat and mouse game with them, and we will come back to his debating agility over the coming weeks. Jesus cuts to the chase when he says to them: what do you think about the story I am now going to tell you? He then offers the parable of a father’s request to his two sons to assist him by working in the family’s vineyard. Jesus seems to be saying: look, authority is about the way you recognize or not as the case may be, your responsibilities. The parable seems to make a point about the importance of accepting responsibility. We accept responsibility not through what we say, but through what we do. The first son refuses his father’s request. This is an action that would have been unthinkable in the patriarchy of Jesus’ day. Even-so, he appears to change his mind. Having said no, he goes into the vineyard, anyway. Jesus’ larger point here concerns the nature of the Kingdom of God. Entry into the Kingdom is not about being the right kind of person with the right answer. Entry to the Kingdom is about our longing to be part of it, our need to be part of it, and our welcoming its arrival through our actions. As a society we are overwhelmed by the multiplicity of vineyards clamoring for our labor. We long to throw ourselves into impactful action, while at the same time fearing committing ourselves. Even if we want to say yes, but are fearful of following through. What happens to the first son? I mentioned earlier that he seems to have had a change of mind. Changing ones mind is something we do a thousand times a day. It’s an action mostly involving little cost or consequence for us. Actually, the word Matthew uses translates better as a change of heart. The first son has a change of heart. How much more significant are those moments when we have a change of heart. A change of heart is not only a less frequent experience for us than merely changing our minds, the consequences of a change of heart are far reaching. a truly worldwide concern for public health. the alarming deterioration of the environment, posing the single greatest danger to people everywhere on the planet. Each of us will have our own personal list of issues and our own personal prioritizing and defining of these issues. Generally though, we mostly agree on the issues. It’s our different ways of defining the issues and our disagreement on the solutions that bedevils effective community action. Since the latter part of August I have been calling to the community in which I serve, for all of us to contemplate the ways we might fruitfully labor in our communal vineyard. I am hoping that my hearers will experience a siren – as in increasingly irresistible, quality to my call. Where – in what areas of community life – is God offering me an opportunity for fulfilling my longing to make a difference beyond myself? As a spiritual community, where – in what vineyards – might God be calling us to invest ourselves so as to make a difference in the wider world around us – in the city, in the state, in the nation, and in the world? We can easily become like the religious authorities Jesus confronts in the Temple. Our imaginations can become limited by our desire to play it safe and avoid taking risks. Yet, God is out there in the world waiting for us to join-in and to follow through on our good intentions. Can we make a difference? My good intention is to find ways to respond to this cry of the heart erupting from deep within me. My good intention is to facilitate the members of my community, employing their knowledge and skills, but above all their passions to participate together in building a community that does make a difference. Skinner notes that the transformation of good intentions into actions is not merely a desire to keep ourselves busy and distracted from our real longings. When we follow through on our responsibilities we discover our heart’s desire. We find those places of encounter with God in the world, and we find out how much God has been waiting for us to make a difference. The artwork I have been using for some time as the banner picture on my blogsite comes from a set of murals in Coit Tower in San Francisco. On a visit a couple of years back I was taken with the utopian feel, so characteristic of social and political art from the early decades of the 20th century. As Fall has approached I have switched the banner from a busy urban street market scene to that of the countryside where we see a romantic image of the rural idyll at harvest time. In the world of this picture we see clean and suitably attired men and women contentedly working at gathering-in the harvest. To our eyes it’s quite a gendered picture, yet it presents an image of a community working together in pursuit of the common good. This picture is a depiction of human hope in a period of hopelessness as the long grinding years of the Great Depression wind towards their conclusion. In the darkest of days this picture captures the desire of our collective imagination. This is a dream of full and constructive employment. Men and women working in jobs that sustain order and provide the protection of livelihood. This is a vision of employment that generates the resources not only to meet the daily needs of individuals and their families, but is capable of generating the wealth a society needs for the preservation of social a sense of the common good. For me, the murals of Coit Tower represent a very early and mid 20th century dream. I note with some sadness that as the 20th century progressed the dream became tarnished and so it now seems not to be a 21st century dream. This is a dream that becomes imaginable only as a result of the Industrial Revolution with its need for mechanized and organized labor. The scene that unfolds for us in Matthew 20:1-6 represents the predominant picture of employment prospects prior to the Industrial revolution. For most of history the scene from Matthew is the norm. Men whose only resource is the hiring-out of their bodies in manual labor, gather at the break of each day on the off chance that they might be hired through a process of random selection. Being hired meant food on the table that day, not being hired meant hunger. However, the parable of the laborers in the vineyard is, sadly, not a situation consigned to history. It’s a scene that is played out daily in our own time in countless Home Depot parking lots throughout cities like Phoenix, Arizona, and in small agricultural towns throughout Southern California and the South West. Here undocumented migrant workers almost exclusively from Central America, wait under the trees in the searing heat, in the hope that a building contractor or farm foreman will offer a day’s under-the-radar employment. At the heart of Matthew’s depiction of Jesus’ parable of the workers in the vineyard lies an ancient social tension between justice and love. I mention the plight of undocumented migrant workers only to indicate that in our own time we seem to be no better than our forbears at managing the social tension between justice and love. Social stability and prosperity requires the exercise of justice. Justice is enshrined for our Western Societies in the concept of the Rule of Law. The Rule of Law sets out, governs, and adjudicates our social relations with one another. Justice not only governs our external relations, it is also internalized within us in notions of what is fair and equitable. For this reason, we are confronted by the parable of the workers in the vineyard. It actually scandalizes us. We are scandalized by the notion that working all day under the hot sun is worth the same amount of remuneration as working only the last hour before sunset. The parable presents us with a situation we instinctively feel is unfair, unjust, and corrosive of good order in society. This parable presents us with an invitation that is deeply uncomfortable and disconcerting. Firstly, the parable of the workers in the vineyard invites us to confront the selectivity with which we apply our sense of justice. We do truly, cherish notions of fairness and equity, here presented in the idea of a fair remuneration for a fair days work. Yet, we live in a society where people are not paid fairly or equitably in relation to the amount their labor contributes to the prosperity of an enterprise. We remain blind to the inequities that abound in a society where women routinely earn less than men for the same fair day’s labor. We choose to deny the reality that levels of low pay have an adverse economic effect in a society where the economic engine is dependant on consumer consumption. It seems that most of us content ourselves with limiting the application of our cherished notions of what is fair and what is just to the arenas of our own self interest, and others be dammed. Secondly, this parable makes us deeply uncomfortable because it presents us with something that makes no sense to us. When faced with the actions of the land owner, I hear in my head the voice of that old tin-can computer in the 1970’s TV program Lost in Space endlessly reciting: it does not compute, it does not compute! We have journeyed over the summer through Matthew’s narration of the early and middle sections of Jesus’ ministry. Again, and again we have been presented with something that deeply upsets us, namely the reckless generosity of God. It’s bad enough encountering God in the image of a farmer who recklessly scatters the seed at planting. For us, whose thinking is so dominated by notions of economic productivity, the actions of God as the farmer appear as down-right crazy and negligently inefficient. To add insult to injury today we are confronted by the image of God as this landowner who similarly scatters his coin in the same way he scatters his seed. None of this computes in our way of thinking. In society, and within our own thinking we are engaged in the struggle between justice, on the one hand, and love, on the other. Speaking personally, I don’t like the way the love of God seems to challenge if not obliterate the notions of justice by which I live my life. I don’t like the implications that love trumps just deserts, of love trampling over notions of worthiness and entitlement, proper reward and appropriate punishment. These are notions I hold dear and they support the fantasy that if I live virtuously according to the norms of justice I will be somehow rewarded and protected from the vagaries of chance happenstance. According to this way of thinking misfortune only happens to undeserving people. The love of God scandalizes the worldview I tenaciously cling to for security. I suspect that the love of God scandalizes all of us. The realization of God as an indiscriminate and reckless lover disturbs our neat ordered little lives. If we allow ourselves to connect with our discomfort, we encounter an invitation to move beyond the way we reconstrict the higher concepts of justice to fit our need for clarity and certainty. Through facing-up to such an invitation we come to see that measured notions of fairness and equity are no substitute for the the generosity of love. We favor regulated and constricted notions of justice to support us in the illusion that what we have is ours, the fruit of our own toil. We believe in our own virtuous, hard working entitlement. In the image of the generous land owner, God discomforts our secure assumption that we are the hard working laborers who have toiled from dawn to dusk. Do we not seethe with outrage when we see the lazy and the indolent given rewards they have not worked for? We are disturbed by the reckless generosity of God only if we think we are among the deserving, those who are owed a reward commensurate with our hard work and responsible toil. But, what if our self confident self assertion of our own worthiness means nothing to God? What if it’s you and me that God has us in mind as the needy recipients of his reckless generosity? What then? Jesus has been exploring his ministry in the context of traveling about the Galilean countryside. He has been preaching, teaching, healing, miracle-working, and getting into hot, debate. He has experienced grief at the death of John the Baptist, rejection by his family, neighbors, and the religious authorities. He seems to have had an ah-ha moment on a journey into the neighboring territory of the Phoenicians, where confronted by the demand for healing from a woman of all people, a woman who would not take no for an answer, he grows into an expanded understanding of his ministry. From this point on Jesus’ ministry is no longer only to the lost sheep of the House of Israel, but to everyone, regardless of race, and we might add gender, class and sexual orientation. Jesus’ ministry in Galilee culminates with the feeding of the 5000. 5000 along with the number 12 have particularly Jewish significance. Matthew is telling us that the miracle of the feeding of the 5000 is a Jewish meal. Jesus then journeys into the borderland, by way of walking across the Sea of Galilee in the midst of a storm. On arrival in the region of Tyre and Sidon he is confronted by a foreigner, not just a foreigner but a woman to boot. From this encounter he seems to grow in his self-understanding of God’s purpose for him. Upon his return to Jewish territory Jesus performs a second feeding miracle, the feeding of the 4000. For Matthew this is not a repeat of the earlier story. This is Matthew constructing a new event where the numerical signifiers 4, and 7 indicate that the feeding of the 400o is a Gentile meal. It’s in the borderland that Jesus discovers the missing piece to his identity. The borderland is a place that is beyond his familiar, Jewish environment. There seems to be a message here for us! We are at the mid point in Matthew’s narration of Jesus’ ministry. From now-on Jesus’ attention is directed towards Jerusalem. The road to Jerusalem is the road that he now takes and it’s the road to Jerusalem that we are to accompany him on, as we journey from summer to autumn. Accompanying Jesus on the road to Jerusalem is a journey of discovery. Along this road we will discover what it means for us to be his disciples. As we journey soon into the new beginnings of post-Labor Day autumn, what will it mean to deny ourselves, take up our crosses, and follow Jesus? More, certainly, than giving up a few things; more than suffering as part of the human condition; more than moving forward on new paths—peering into autumn’s transitions, we belong to one another. In Matthew chapter 18, Jesus addresses how his disciples are to behave towards one another as they begin to travel with him on the road to Jerusalem. One might imagine that his comments are particularly addressed to the process by which the disciples will negotiate differences and conflict between them. If Skinner’s assertion that we belong to one another is to have any meaning then we have to understand Jesus’ teaching on our responsibility for one another, and our individual accountability for one another, especially around issues of difference and potential conflict. In a culture where Episcopalians have come to treat membership of the Church as another version of our membership of any number of voluntary and nonprofit organizations, the idea that we are responsible for, and accountable to, one another rings alarm bells. No one is going to tell me what to do, we mutter to ourselves and, if I find I don’t like it, then I will just leave, has become our solution of choice when faced with the inevitability of conflict in our social worlds. If another member of the church sins against you…just talk about them behind their back. If another member of the church sins against you…just call a bunch of people in the church to complain about them. You may even want to start a letter-writing campaign against them. If another member of the church sins against you…just send them a nasty email. Copy the clergy. And, while you’re at it, CC the bishop. If another member of the church sins against you…don’t say anything. Just avoid them. Un-friend them on Facebook. And, if you can’t avoid them on Sundays, then just leave the church. Matthew 18: 15-20 has become engrained in our collective unconscious as the epitome of the abusive and oppressive way religious communities treat people. These verses have been used to justify the abuse in religious communities of shunning, which is invariably a form of officially sanctioned scapegoating. We need have no fear of this happening to us within the Episcopal Church, because most of us don’t give that level of priority to our Church membership. That we might be accountable to one another makes us shudder. This is our collective unconscious fear coming out, a fear from a time when inclusion and exclusion from community carried implications of life or death. Our collective dread is further compounded in our individual experience because ostracism is one of the most painfully reoccurring personal experiences of growing up. We don’t particularly care for the experience of being accountable to another person, or group of persons, especially if they seem to be just like us, with no more nor less claim to authority than we possess. We read Matthew within a frame colored by our experience of school days. For most of us being accountable to another leads to a step-by-step process of ratcheting up the pressure that groups use to ensure conformity. Firstly one person confronts you. Then if that does not go so well, and it invariably doesn’t, they come back with an ally. When that doesn’t achieve the desired result a gang of persons, and eventually the whole group or community then ostracizes or expels you, that is, if you haven’t jumped ship, first. Yet, what happens if we read Matthew within a new frame created by substituting the word to with the word for? In this frame we are no longer accountable to, but become accountable for one another. The image of Jesus communicated to us through the Gospels is never one of him resorting to hierarchical authority. Even in Matthew, who presents us with the most Moses-like image of Jesus, Jesus is presented as having authority, not as being authoritarian. Reading these verses against this larger experience of Jesus leads me to suggest that Jesus is asking his disciples to be responsible for one another and not to one another. Matthew opens chapter 18 with Jesus talking about the adult abuse of children. The implication follows that if we are not to abuse children then it makes no sense for us to use power as the instrument for abuse of one another. I take Jesus to mean that within our community life we are to be accountable for one another. This means looking out for one another. Sometimes, looking out for one another involves addressing behaviors that are harmful to relationships between individuals. Sometimes, looking out for one another makes it necessary to challenge one another when if left unchallenged, our behavior endangers the stability of the whole community. Sunday September 7th is Homecoming Sunday at St Martin’s in Providence. Unlike anywhere else I’ve been, there is a sheer literality to Homecoming Sunday in the life of Rhode Island Churches, where the custom for many is to make good use of summer weekends for trips to the sea and elsewhere because as all Yankees know- winter is coming! So this is an appropriate time to pose the questions Lose frames above. As we journey together into the mists and mellow fruitfulness of the Fall, what kind of community are we on the way to becoming? I would like us to be always in the process of becoming a community where relationship rests on a mature capacity to negotiate our differences face-to-face. For me conflict is inevitable in any healthy Christian community. By healthy, I mean a community where people engage with their passion in the task of worshiping together, loving each other and serving the world. Where passions are engaged strong feeling is always in play. I don’t fear strong feeling. My fear is to be part of a community of lukewarm feeling, where difference can be avoided because ultimately, nothing is important enough to fall-out over. Where the personal cost of leaving the community is so inconsequential because if we don’t like St Martin’s there’s always somewhere else to go; though evidence shows that when Episcopalians stop going to one church, we stop going to any church. Our Gospel pericope (section of verses) ends with Jesus’ enigmatically speaking about agreement and gathering together in his name. Given that this comes at the end of a teaching on mutual accountability, agreement must refer to some form of common accord. Does this mean that we have to agree with one another before we can gather in his name? Does agreement envision eradication of difference? Because most Christian traditions stress theological agreement does gather together mean the fruit of theological agreement about what’s true and what is false? My answer to each of these questions is a resounding no! Shared agreement is not available to Episcopalians. We can be likened to the Jews of the Christian world because the only thing we can agree on is that we don’t agree about much. What this actually means is not that anything goes, but that we are a communion, which is a word that signifies relationship rather than structure. We recognize that the world can be viewed through several difference lenses. We acknowledge that there are broadly speaking, several worldviews possible. We see no reason to pretend that these differences of worldview will not be reflected in our communities. It’s not shared truth, but common worship that holds us together. It’s within a communion of relationships we become accountable, i.e. lookout for one another. peering into autumn’s transitions, we [find that we] belong to one another.